Dead men may tell no tales, but Disney's Pirates of the Caribbean have entertained millions with their salty tales. A landmark achievement in theme park storytelling when it debuted in 1967, Pirates remains one of Disney's—and all of parkdom's—most beloved attractions. First-timers and those returning with nostalgia-tinged memories alike adore its timeless tales and pitch-perfect presentation. Small splashdowns, mildly frightening images. Pirates of the Caribbean may be the quintessential theme park attraction. It is a masterful blend of fanciful storytelling and high-tech wizardry—but as is the case with the best attractions, the latter never overshadows the former. The robotics, special effects, conveyance system, music, and other elements meld seamlessly to sweep guests away into a mythical, three-dimensional pirate world. The experience varies slightly depending on the park. The original Disneyland version, personally overseen by Walt Disney, has an extended "grotto" sequence at the beginning of the attraction. This is where the coveted treasure lies. Also unique to California, Pirates resides in the New Orleans Square area, and its boats drift past diners in the enchanting Blue Bayou restaurant. (Epcot's Mexico pavilion uses a similar concept with its restaurant and boat-conveyed attraction.) In Paris, the boats go up a ramp to begin the attraction and deliver the splashdown as a finale. The first major scene places passengers squarely in the middle of a raging buccaneer battle. Pirates, apparently attempting to ransack a town under the cover of night, fire their cannons. The townspeople fire back however, and the water around the guests' boats reverberates from the blasts. Moving into the town, the pirates round up the mayor and try to get him to reveal the location of the booty by dunking him in a well. The extraordinary detail of the attraction comes to life here. 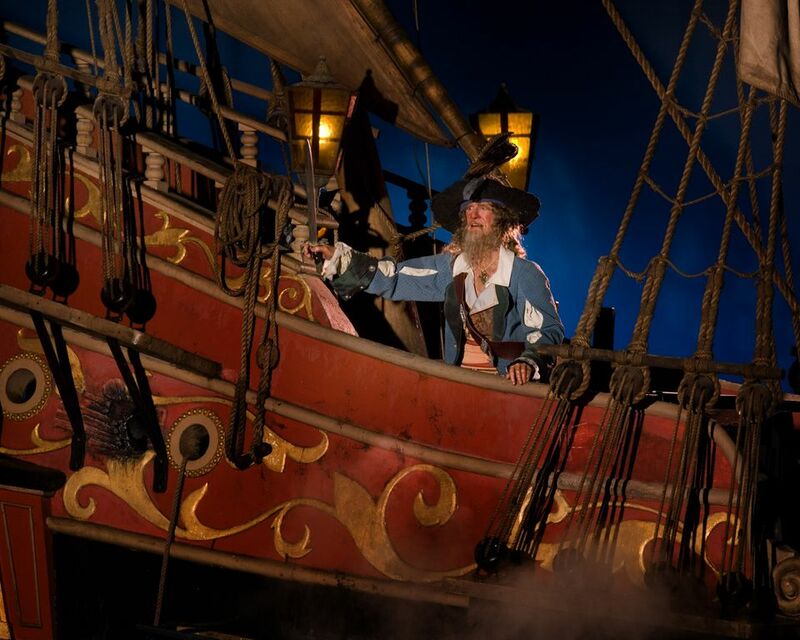 Disney literally and figuratively set the stage for future theme park attractions with Pirates by incorporating lighting, music, dialogue, costumes, set design, and other techniques to tell the story. Some are borrowed from film and theater; other techniques are unique to attraction development. But in 2018, apparently bowing to changing mores, Disney altered the auction scene and made it more politically correct. It was not the first time that Disney updated the classic ride. In the following scene, guests see woman with rolling pins and brooms chasing pirates in an endless circle. Originally, the pirates chased the women, but in the 1990s, Disney altered the scene. I guess it's still OK to portray public drunkenness, looting, and arson, however. Things take a turn for the worse as fire rages through the town. The oblivious pirates seem more interested in drinking their rum than escaping danger. The famous "hairy leg" pirate sits idly on a bridge above the guests as fire consumes the village. A trio of pirate prisoners is intent on escaping the inferno. They try, unsuccessfully, to coax a dog into bringing them the key to their cell. In 2006, characters from the popular Pirates of the Caribbean films, which were, of course, inspired by the ride, came full circle and were incorporated back into the attraction. Remaining true and reverential to the original story, the ride now features startling animatronic figures of Captain Jack Sparrow as well as some of his shipmates. The attraction ends just as the fire threatens to detonate a storehouse of powder kegs. Then it's on to the REAL booty: Disney's huge gift shop stuffed with Pirates doodads. While the Pirates rides remain beloved and on virtually every list of the best theme park attractions, they have been surpassed—by a next generation Pirates ride. Pirates of the Caribbean Battle for the Sunken Treasure at Shanghai Disneyland is the rare sequel that outshines the original.